The Kaul family is one of two crime syndicates that control the island of Kekon. It’s the only place in the world that produces rare magical jade, which grants those with the right training and heritage superhuman abilities. The Green Bone clans of honorable jade-wearing warriors once protected the island from foreign invasion–but nowadays, in a bustling post-war metropolis full of fast cars and foreign money, Green Bone families like the Kauls are primarily involved in commerce, construction, and the everyday upkeep of the districts under their protection. 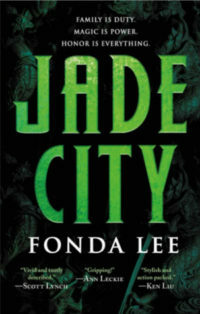 I received Jade City last year and it sat on my TBR for a little while. In order to meet one of my bookopoly challenges, I put up a twitter poll to let the fates chose my next read. Jade City had been getting a lot of positive buzz, so I was really looking forward to reading this book. This isn’t a light read and it has a lot of political manoeuvring between the clans that would sit really well in Game of Thrones. I will admit that I was pretty spot on with how the plot was progressing. It was building up to a showdown between Len and the leader of the Mountain Clan. I could feel the tension building, especially with the fact that his brother, Hilo seems to be on a mission to bring his clan into a war. I could also see how the pressure of being the Pillar of the clan (sort of like the chief) is starting to get to Len. This is really evident after he faces off against the Mountain Clans Horn (like an enforcer). As per the world building set out by Lee, Len won the Jade that the Horn had, but it starts to put a strain on him. This sets out a series of events that result in a really shocking event that I didn’t see coming. It changed the whole projection of the book and I found myself drawn further into it. By the end of the book, I was unsure what would happen. So much had happened that I hadn’t even considered. By the end of the book, I was exhausted but I know that this is just the beginning of really gripping saga. As always, a great book needs to characters that you become invested in their journey. Out of all the cast of characters in this book, two characters really stood out for me. The first was Shae, the only sister of Len and Hilo. She had spent time away from her family and the town she grew up in. Having lived without using Jade, she hopes to continue to do so when she returns home. Shae also wants to live without the aid of the Clans influence. Shae has clearly got a taste of being independent and wants to continue with this, even though she has returned with her tale between her legs. Shae was one of the most sympathetic characters in the book as she is pulled back into Clan politics against her will. Seeing her independence slowly being eroded away, as events put her in more danger is both quite sad, but it also showcases her rise and importance in the clan going forward, especially with her new role. I can see her being the true political heavyweight, going forward in the series. However, she is going to have to learn much quicker if she is going to be a match for the Mountain clan. The other character is the adopted family member, Anden. He is the offspring of a member of both clans. He is about to graduate from a training academy. I quickly began to suspect that Anden would play some important part in the overall Saga. Although this did seem to be proven true towards the end of the book, Lee once again pulled the rug from out under me and much like some of the others I was left in shock. I don’t think this is the end of his involvement and I think that he is going to come back in at some point, but at this point I don’t know for which side. Anden is one of the more conflicted characters and you can see he is torn between clan loyalty and what he feels is right for him. He wants to keep loyal to his adopted family, but something happens that scares him to make this brave decision. I can’t wait to see what happens next. Jade City is a sweeping drama, that really does keep you on your toes. The fact that Lee leads you along, what you think, will be a predictable plotline of warring clans vying for control of the city and instead takes you by complete surprise with unexpected turns, is just amazing to read. For those that are looking for a series to fill the void awaiting the next Game of Thrones, I recommend picking this book. Yes, it might not have dragons or white walkers, but it more than makes up for this with double and triple deceptions by the characters in this book. Give it a try! You won’t be disappointed.